Stylish, warm and versatile, the Cressi Fast 5mm Ladies Wetsuit can be used in the widest range of temperate and cold waters. Durable 5 mm, double-lined neoprene, stands up well to compression at depth for maximum heat retention. 5mm of neoprene is enough for most divers in the warmer months in southern Australian waters, and the colder months of northern Australia you can use it all year round. When the water temperature drops you can layer up with undergarments, or switch to a 7 mm or Drysuit. 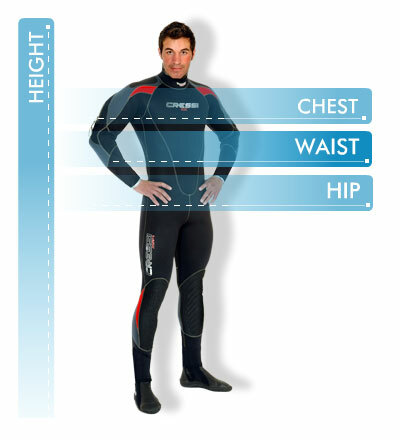 Stylish and warm, the 5 mm Cressi Fast wetsuit is about as versatile as it gets when it comes to thermal protection. The suit's durable double-lined neoprene stands up well to compression at depth for maximum heat retention and comfort. The wetsuit includes ultraspan neoprene on the arms and calves and pre-shaped legs for enhanced flexibility and easier donning and doffing.